Discard 1 card; Fusion Summon 1 Fusion Monster from your Extra Deck, using monsters from either side of the field as Fusion Materials. Cards and effects cannot be activated in response to this card’s activation. This wasn’t the Shaddoll support I was looking for. Super Polymerization is an awesome card, a versatile card that benefits many decks, but can we please get Construct back? Anyways, a Quick-Play Spell that grants you a Fusion Summon is pretty good. Use your opponent’s monsters as well? Awesome. Protection against negation of the summon or this card? Amazing. Shaddoll and E-HERO get this card back in their main deck and have access to any of their fusions again. Discarding one card is hardly a balance when you are also using your opponents monsters. You are removing field presence of theirs and pushing your own. Direct attack with monsters and then use Super Poly and get an additional attack with your new fusion monster. You don’t need your opponents monster(s) either to Fusion Summon with this card. This card works best now as a potential out to the Extra Link problem in the meta, as well as an easy out to Link Monsters. It will be interesting to see if Super Polymerization will cause any kind of shakeup in the meta. A side deck card alongside a Fusion or two and then see them sided in? The only thing wrong with this card is the artwork. The only thing keeping it from perfection is the discard cost to activate. Otherwise Super Polimerization is back for at least a few months to wreak havoc on either side of the field. A proper Fusion Summon that can’t be negated on a QuickPlay Spell Card is already something to pay attention to. At the cost of a card from your hand, you can use unlimited monsters from either side of the field to Fusion Summon any Fusion Monster from your Extra deck. You don’t even need to have monsters on your side of the field to use this. Imagine playing this against Blue-Eyes or Cyber Dragon. That would be such a slap in their face that could not be negated or responded to at all. If there were multiple, you could activate as many as you wanted in a single turn. Alas, it is limited because it is so powerful. I hope they refresh the artwork on Super Polymerization, and I hope Construct comes back as well. Other than that, take it out of the binder and put it in the side deck at least alongside some common generic fusions. And it’s searchable? Wow. Oh Phantom Darkness, you had a ton of insane cards didn’t you? Today we will look at a card that came back from Forbidden to Limited once again, Super Polymerization. Super Polymerization is a Quick-Play Spell that lets you discard 1 card to Fusion Summon 1 Monster using monsters from either player’s side of the field as materials and neither player can activate cards in response to this card’s activation. Well this escalated quickly, being able to Fusion Summon using either field is insane, plus not having the chance to negate this is better. This card can also affect monsters unaffected by card effects like the original Polymerization can since it is a Fusion Summon and the monster is a proper material. HEROs loved this card to fuse their HERO with a monster of a various Attribute that isn’t DIVINE to summon any of the Attribute-based Elemental HEROs from the Extra Deck. Shaddolls used this as well since they had various different Attribute-based Fusions as well, the most popular being Construct (which is at 3 in the OCG now and I kinda want to play that game, lol). This can be good to getting rid of a problem monster while summoning something of your own. With Mudragon of the Swamp, you can easily out an Extra Link as long as there are monsters with different Types but the same Attribute. Don’t get me started on this being Spell Speed 4 again either, that is what made this card more busted. Super Poly can be an insane card, but is a welcome addition to the game to out Extra Link boards. Art: 2/5 Yep, standard Fusion artwork. I remember when we looked at Super Polymerization for the first time way back when (link here) Mandatory note about how I miss Ex Minion of Darkness…so back to this guy being Limited…this is honestly probably the best generic Polymerization variant there is. Elemental Heroes and Shaddolls make sweet love to this card…as well as Gem Knights…and others. The discard required here does bring Super Polymerization down a little. Not enough that people don’t use it, and since you have the added joy of being able to use your opponent’s Monsters with this, a discard does make this a little more fair, in my opinion. The protection/negation against its own activation is probably the biggest asset here, that and/or this being a QUICKPLAY…it does hover on overpowered honestly. 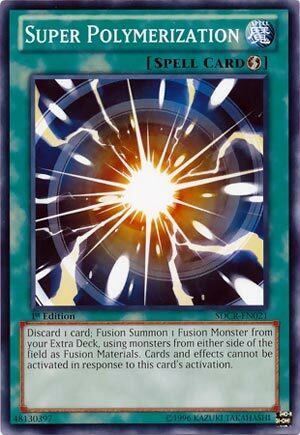 Your Summon is still considered Fusion Summon, so that’s worth pointing out, and given the relative ease here of how this can be abused, I understand why it’s at 1. The argument as to why it was/should be Banned is just as valid though, but this Format (as I touched on in my article) really seemed to smile on Heroes, so I expect to see lots of this in and out of them.